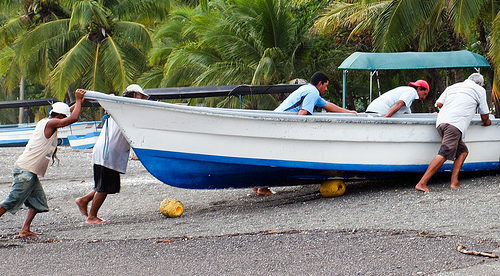 Sport fishing is a popular activity off the coast of Samara which is located in Costa Rica's Nicoya Peninsula. Fancy a few hours battling a half-ton striped marlin Hemingway style? The fish can get so big off the coast of Costa Rica that the skipper straps you into a chair to fight them. The waters of both coasts, the Pacific and Caribbean teem with legendary fish like marlin, dorado, and tarpon that, for decades, have drawn serious sport fishermen (and women) from around the world eager for record-setting catches. The Pacific is the place to be for “big game” fishing. You couldn’t ask for a better location for deep sea fishing. The continental shelf drops off very close to the coast, much closer than California, for example. That means deep water, thousands of feet deep, where the billfish (a term for swordfish, sailfish, and marlin) live, is a much shorter trip from land. The 80-degree water keeps the big fish happy too. “Off Tamarindo, you only have to go eight to 10 miles to get to 1,000 feet deep,” says Capt. Lee Keidel, 35, who’s been fishing in the region for 10 years with his business, Kingpin Sportfishing Co. The trip takes about 45 minutes compared to a couple of hours in the U.S.
Grand slams, catching three different species of billfish in a day, are common, as is catching 10 to 20 swordfish in a trip, something rare farther north. These are trophy fish. Although it’s catch and release, models are created by taxidermists based on photographs, something worth hanging in the den back home. Red snapper, grouper, mahi mahi (known locally as dorado), wahoo, Spanish mackerel, yellowfin tuna, and snook, are also abundant. All make good additions to the dinner table. Most local restaurants will cook up your day’s catch for a small fee. On the country’s northern Caribbean coast, a region dominated by a huge national park and wildlife conservation zone, you will find fishing lodges reachable only by plane or boat. Here tarpon, a prehistoric species known for its strength and tendency to jump out of the water up to a dozen feet when hooked, is the species to hunt. Tarpon fishing requires more technique than brawn. The Gulf States, especially southwest Florida, Louisiana, and the Florida Keys are known for tarpon fishing. But you can only fish them during certain migration periods. In Costa Rica, you can fish tarpon all year round. The tarpon in the Caribbean are different than stateside tarpon in other ways. They’re much bigger, a result of the catch and release policy of the national park. So more fish are able to grow to maturity— tarpon live about 60 to 70 years. “The average weight is 110 to 140 pounds, with lots of them in the 200-pound range. Nobody is killing them here. So they have a chance to grow. They’re sitting around here getting fat and happy,” says Dan. Whether you’re a serious fisherman or casual beginner…after big game or the elusive tarpon…Costa Rica has something for you. Editor’s Note: Learn more about Costa Rica and other countries in IL’s daily postcard e-letter. Sign up for these free daily postcards here and we’ll send you a FREE REPORT – Why Are Americans Still Flocking to Costa Rica.